Tired of chalky protein bars with zero flavour? 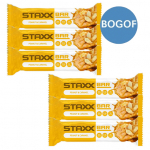 You’ve come to the right place because these STAXX Bars taste great, eat great and boast an epic nutritional profile! High in protein, low in carbs, the STAXX Bar is designed to support your workout goals by giving your body a brilliant protein boost with every bite. Better yet, these bars are high in fibre, low in sugar and are covered in real milk chocolate to satisfy your sweet tooth – boom! Ideal for anyone looking to build muscle or drop a few pounds, these handy bars can be enjoyed at any time of the day – pre or post workout, or even at elevenses. It’s a protein bar experience unlike any other, whether you’re searching for an on-the-go snack or shake substitute, STAXX bars are the perfect choice. Also available in a 12 pack. Milk Chocolate With No Added Sugar (Sweetener (Maltitol), Cocoa Butter, Whole Milk Powder, Cocoa Mass, Emulsifier (Soy Lecithins), Flavouring), Milk Protein, Collagen Peptides, Humectant Glycerol, Oligofructose, Soy Protein, Water, Maltitol Syrup, Cocoa Powder, Roasted Cocoa Chips, Palm Fat, Cocoa Butter, Whole Milk Powder, Tapioca Starch, Emulsifier (Sunflower Lecithins), Flavouring, Salt, Colour (Plain Caramel), Sweetener (Sucralose). Store in a cool, dry, and dark place with a temperature <25 degrees. Nutritional information based on Milk Chocolate flavour. Nutritionals may vary slightly from flavour to flavour.